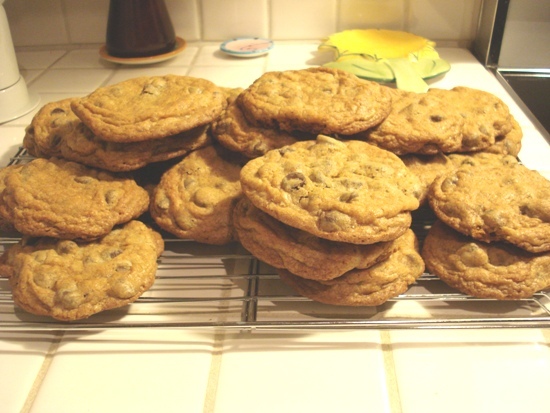 This is the recipe I selected to help make for my SIL’s Cookie Exchange over a week ago. The recipe states it’s a copycat of Mrs. Fields’s, but I seriously doubt that. This is 3x better! Sorry Mrs. Fields! I had taken out the butter from the fridge while making the Chocolate Waffles. But with an impromptu trip to the grocery store for more ingredients, and briefly driving through a few blocks that were beautifully lit up with Christmas lights & decorations, getting take-out dinner and devouring it….well, let’s just say, the butter was left out 3x longer than need be. Oooopsie! From my past experience of leaving out the butter too long, it changes the cookies somehow. In this case, it was flatter than norm. The taste? OMG! 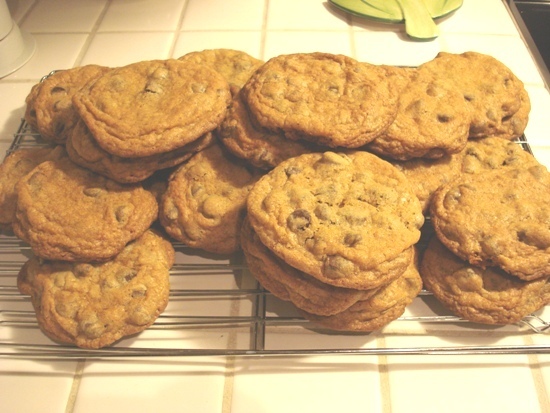 Make a batch yourself, then let me know if they’re not the best cookies you’ve ever munched on. 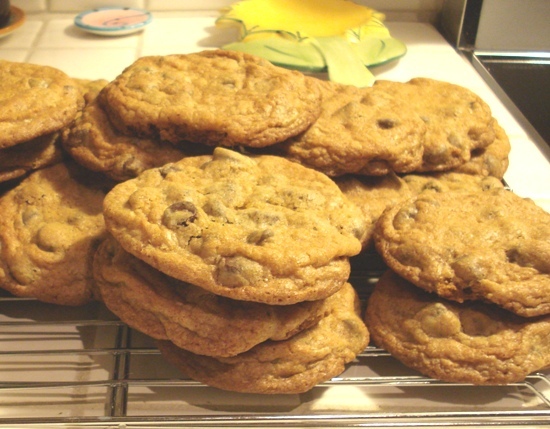 *Note: For less sweet cookies, decrease brown sugar to 1 1/4 cups and semi-sweet chocolate chip morsels to 2 1/2 cups. Place golf ball-sized dough portions 2-inches apart on an ungreased cookie sheet. Bake 9-12 minutes or just until edges are light brown. Remove from oven while they still look undercooked; they will firm up as they cool. TIP for new bakers: Try to use insulated cookie sheets. They’re the absolute best for cookies! My husband is not that big on sweets. I made these cookies and he ate almost all of them by himself. We loved the fact that they stayed soft until they were gone!